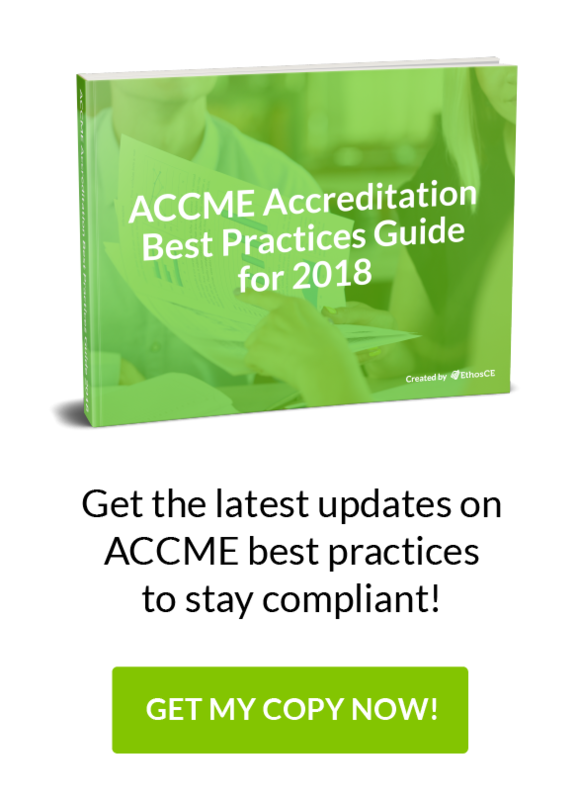 Creating the accreditation Self Study Report is one of the most important—and intimidating—components of the ACCME application process. If you’re reading this, it’s likely that you’re well aware that any significant error—such as missing or incomplete information— can make the difference between your application’s approval and rejection. The Self Study report allows the ACCME to evaluate your commitment to offering exceptional continuing medical education and your unique value to the medical community as a provider. That means that your ability to articulate your association’s mission in the context of demonstrable value to the medical community is critical to your application’s success. If that seems like a lot to synthesize into a single report—and almost impossible to do without some sort of expert guidance—you’d be right. Thankfully, ACCME requirements are quite clear, and you’ll be able to use their directives to build a powerful narrative to support your application. First, let’s get a brief overview of the Self Study process. You’ll need to conduct an extensive evaluation of your CME program’s current organizational structure, educational resources, and learner outcomes. In addition, you’ll need to supply anecdotal evidence of your CME program’s compliance with the ACCME’s accreditation requirements, including the Accreditation Criteria, the Standards for Commercial Support, and related directives. Based on your findings, you’ll identify areas of your CME program that need improvement and determine if your association has the capacity to resolve those issues. You’ll use the data from the above evaluation to create a “forecast” of your program’s future direction. You’ll need to answer questions about how well the structure of your CME offerings can handle growth and adapt to the changing educational needs of a diverse pool of learners. You’ll also present any long-term plans to expand or diversify your CME programming, along with supporting data showing why you believe these changes will benefit the medical community at large. The results of your review will be summarized for the ACCME Self Study and will serve as your association’s “resume” during your final ACCME interview. Collect and review data on how your learners engage with your CME program and the resulting impact on their professional competencies and/or patient outcomes. List the steps taken to improve learner outcomes and inspire continued engagement. Detail your association’s methods of maintaining program compliance and identifying areas that fall short of ACCME standards. Now let’s look at how to format an ACCME Self Study Report, based on some of the answers that you’ll need to provide. Enter a short narrative on the history of your continuing medical education (CME) Program. Submit an organizational chart that presents the structure and of your CME program. Enter your CME mission statement and detail projected results for your learners, in terms of performance-in-practice and patient outcomes. Describe how your association identifies the educational requirements of your learners. Explain how you determine which educational needs are relevant to the professional practice gaps that you aim to address in your CME programming. Describe how your CME program’s activities are structured, and how the format and curriculum are specifically designed to enhance the competence, and/or professional performance of participants. Provide evidence of the independence of your CME program from commercial interests. Describe the process that your association uses to disclose to learners the financial relationships of anyone with influence over educational content. Describe the process that your association uses to disclose to learners any source of support from a commercial interest. Based on activities data, present an analysis of the changes achieved in your learners’ performance-in-practice and patient outcomes. Provide an analysis of the percentage of your expected results presented in your CME mission statement has been met. This is just a sampling of what you’ll be asked to explore in your Self Study report. There’s a consistent theme here, and you’ve probably guessed it: your narrative, sans the right data, will count for nothing. That means that the way you handle your data, format, and present your Self-Study is your most important challenge in the ACCME accreditation application process. Nothing matters more to the success of your efforts, and that responsibility shouldn’t fall on the shoulders of your CE. Let us help. For 16 years, Ethos CE has been helping medical associations manage PARS submissions and monitor CME ACCME compliance.